It is one of the oldest game reserves in South Africa and is famous for pioneering the wildlife photographic safari. The wildlife offers some excellent viewing and you are spoilt for choice as far as well priced luxury lodging goes. This 14 000 hectare reserve offers the Big 5 experience and much more. 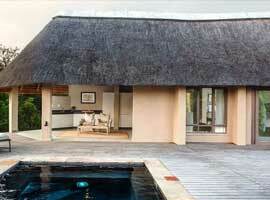 The lodges range fom luxury suites, fully-inclusive lodges and exclusive use self-catering lodges. If you have young children with you, many of the lodges at Thornybush cater to families with special activities available for little ones. Wildlife highlights include the big five and 500 types of bird. 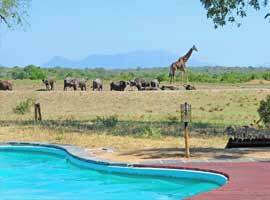 Lodges offer game drives, walking safaris and children’s activities. If you are unsure which one to visit, ask one of the LastMinuteLodges reservations staff for advice on which lodge will suit you best. 4 Chalets with a covered patio, twin beds under mosquito nets and en-suite bathroom which include his and hers basins, shower and toilet. 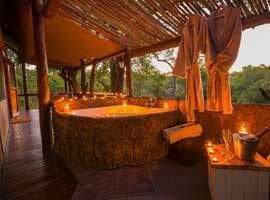 6 Safari Tents with a covered patio, twin beds under mosquito nets and en-suite bathroom which include his and hers basins, shower and toilet. 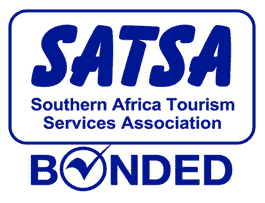 Rate includes : Accommodation, brunch, high tea, dinner, teas & snacks and two daily safari activities. Excellent option for couples and even honeymooners, as there is plenty of privacy, Chapungu's Decor is "old-world colonial" and offers safari enthusiasts an atmosphere reminiscent of the style and class of that bygone era. Walking Safari's are also available. An intimite lodge with only four luxurious suites overlooking the seasonal Monwana River. The Suites are positioned with discretion in mind to ensure a personal and private experience.